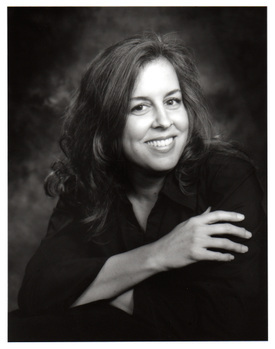 Elizabeth O. Dulemba on tour! 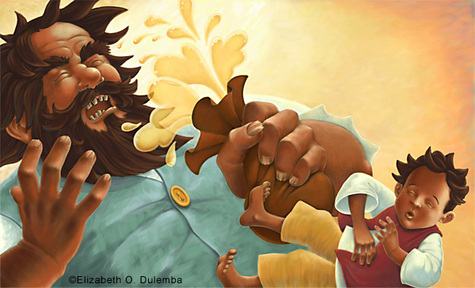 It has been my pleasure to get to know writer and illustrator Elizabeth O. Dulemba, or "e" as she is known to many of us on several listservs and chat boards where we all obsess about children's books. 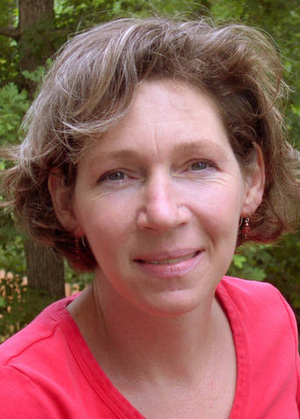 Her web site and her blog are chock full of information, book talk, news, activities, coloring pages, and any given number of other useful items. Please make sure to check them out. 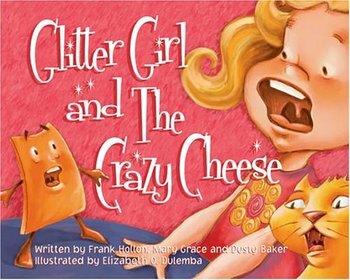 Elizabeth has a new book out and I was thrilled to have her visit my blog so I could get answers to a few questions that I had, not the least of which is where she gets all of her enormous energy. 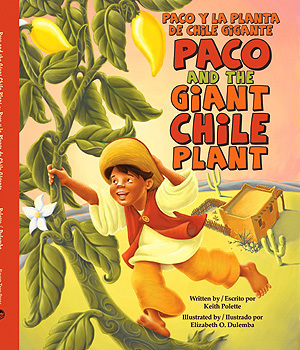 Her latest project is called “Paco and the Giant Chile Plant” written by Keith Polette. This is a retelling and humorous variation on the traditional Jack and the Beanstalk tale, only this one is set in the Southwest. It is told mostly in English with a sprinkling of Spanish, but will be out in Spanish only and English only versions come the fall. The art looks spectacular and is created using very evocative images of the desert and wonderful southwestern hues. SO, enough of me. On to Elizabeth! 1) I am fascinated by your connection to storytelling in Tennessee. How did you come to be involved, and does it make you want to do some story telling of your own? Writing more? In the vernacular of the country story tellers? I love the storytelling tradition. It's an odd story (and a bit of a winding one - sorry), but it will make you believe in fate. Somewhere in there I learned about the National Association of Storytelling and their annual Festival in Jonesborough, Tennessee ( http://www.storytellingcenter.com/festival/festival.htm ). For my Graphic Design exit show in college, I did a line of posters for the event. And here's where it gets really weird - during my research, I found a book in my own collection dedicated to me by my Grandparents in 1973 - "The Jack Tales" gathered by story-catcher, Richard Chase. stories. I fell in love with stories and storytelling, but for some reason, Jack Tales especially seemed to seek me out. difficult to understand.) Survival was off the land, music from the heart, and stories were adapted from the English "Jack" (of "Jack and the Beanstalk" fame) but became their own unique creations in the Appalachian mountains. I've dabbled with oral storytelling since then (fully acknowledging that I am nowhere near as talented as some), but really found my storytelling voice through writing. Even my novels (one with my agent, one still in progress) take place in the southern Appalachians. It seems to be ingrained in me and I have no idea why. 2) I would love to her more about creating the art and design for advertising, but I also was to hear about the epiphany regarding the move to focus on children's books. 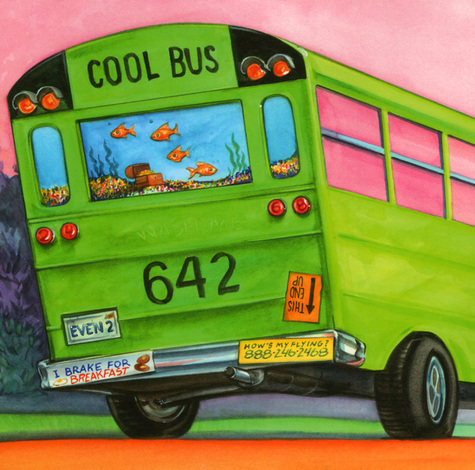 There was never an epiphany - I've wanted to create picture books as long as I can remember. No lie. I used to devour "The Golden Book of Elves and Fairies" illustrated by Garth Williams. His ability to transport me with his art enchanted me and I wanted to be able to do the same thing with my own art. I've always had a vivid imagination, and stories seeped out of me from a very early age, first through drawings and then through words. However, I was a young, single girl and needed to keep a roof over my head. Graphic Design provided steady income. (I also had some growing up to do.) And while those skills help with my marketing efforts now (and I'm very glad I have them), I was always awaiting the opportunity to dedicate my time to picture books. When I married, my wonderful husband understood my dream and allowed me the opportunity to chase it. 3) Tell us about how you work. Mostly digital or mostly conventional, or both? I find it hard not to go back and "adjust" real paintings, myself, so now I also work that way. I still sketch by hand, can't seem to get away from that. But all my coloring and rendering is done digitally. It took years of experimenting to figure out my medium - little did I know I had to wait for it to be invented! But it was like breathing for the first time when I discovered how I like to work best. 4) You seem to loaded with energy!! Where does it come from? And so me a favor: paint the picture of your average, busy day, so I can imagine you in action! I call this a manic-depressive business because it is filled with such unbelievable highs and devastating lows. The lows keep me up at night, but the highs make me jump out of bed each morning anxious to get going. I have so many ideas I want to get out of me and a measly 24 hours just isn't enough to do it all. I'd resent sleep except I get so many ideas from my dreams. I definitely resent having to shower and get dressed every day - how redundant and what a waste of time!! I'm not sure it's energy so much as obsession. But I'm usually in front of my computer by 7:30 and I work until something makes me stop. (Dogs need food, if I don't exercise I'll melt, dinner with hubbie, grocery store, Spanish lessons, etc.) I stay unbelievably busy. It's a bit nuts, I admit it. 5) This is my favorite question to answer, and it is also my favorite question to ask: describe your dream project to me--one that you would like to write and/or illustrate. Oh wow, that's tough. It floats in my head like a mist without sharp, defining edges although I think pieces of it come out in all my work. The idea of transporting the viewer/reader is very important to me. I love creating images of imagination, creatures or scenes that don't have to follow the laws of physics. (It's one reason I love creating friendly monsters - they have no rules.) It's part of why I enjoyed illustrating Paco so much. But ironically, the more I write, the more I see words achieving what I want as well. I think it would be a story in which an inferior-feeling protagonist becomes transported and changed through imagination or outside events - a situation where they become better and stronger, and so does the reader. How's that for vague? 6) SO--what's on the horizon for such a busy gal? picture book stories which I'm currently tweaking (one is bilingual and one is an adaptation of a Jack Tale). So, while this isn't the busiest I've been, it's certainly busy enough! Wow, these were fun and intense questions! Thanks for letting me share! Thanks, e, for taking the time to give such thoughtful answers! 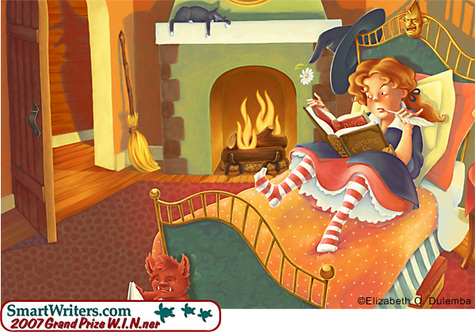 One of the nicest things about the world of listservs and blogs is this wonderful community that I feel that I am a part of: the world of kids' book lovers, writers and illustrators. Of course, even better than having the feeling of being part of that group in love the same wonderful and crazy stuff, is getting to know them better as individuals, one by one. 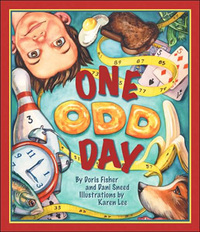 Because of the web, I have had the lovely pleasure of getting to know author and illustrator Karen Lee. I got to ask Karen a few questions, and, being the nosy person I am, I asked questions to answers that I wanted! Like this "married to another artist" thing. Sometimes I like that idea, and sometimes I think my husband and I would live in different continents if it were so. I have friends who are also in that "2 artist" situation. It amazes me. So I am as curious as can be to hear about it, and to see how they all manage to make it work. But that is enough from me. Let Karen speak for herself. Q: My first question is about this 2 artist family thing. Like, whoa! I've been married for 34 years but I don't think my husband and I would have survived us both working in the same field. I want to hear all about this arrangement: ups, downs, and in-betweens. Feel free to let the kids chime in, too! I met Tim in our junior year of college 25 years ago! That is amazing to me. Illustration is such a huge part of who I am I can’t imagine not being able to share that with someone. But we have also had some professional separation. He is an editorial illustrator, is all digital, immensely versatile, and does work for grown-ups (for now, I have a fiendish plan for him). His brother is an artist too, we keep in close contact with many of our old college friends and illustrators that have come and gone from our immediate lives. I can’t imagine not being surrounded by people that I can share such an important part of my life with. There really haven’t been any downs. And the ups are getting better as we get older and are a bit more confident and mature. But we each keep something separate that is just for us: for me it is writing, for him it is playing mandolin in a Bluegrass band. As far as the kids go, our daughter who is ten has quite a talent for writing and is a good artist too, but she’s more devoted to her play time than her inner time. Our eleven year old son is as rebellious as I was. In his case, he is rebelling by wanting to grow up to be an engineer. I love that! I couldn’t have planned it better. 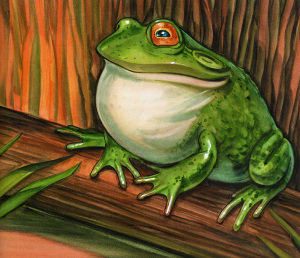 Q: For years I did editorial art, but left it behind for book work. Do you still like doing it? If so, tell me what you find satisfying about magazine/newspaper work as opposed to book work. I still cherish the work I get in the editorial market. I think it keeps me fresh and gives me a chance to expand stylistically a little more than I typically do in the children’s market. It is work that I can do without any of the insecurity I feel sometimes with children’s work. And sometimes it is a huge relief to have a small project that comes in, goes out, gets printed, I get paid, and I’m done! 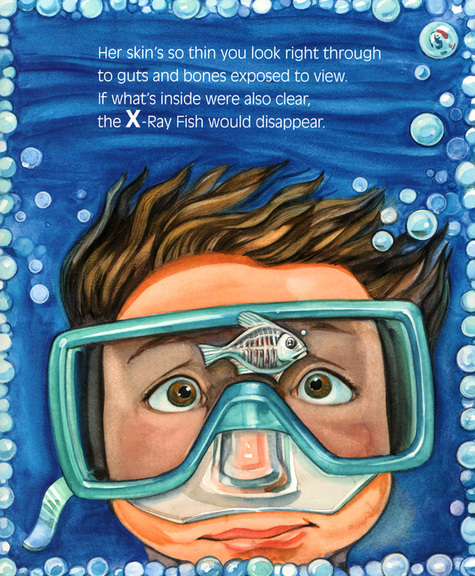 Q: Now that you are an author and illustrator with ABC Safari, how do you see yourself dividing your time down the road? More writing? At a scheduled time? And if you could create your fantasy book, incorporating things you love to draw, what would it be? I would love to do more writing! It has been wonderfully energizing for me to have a new challenge. It is so different from art, and for me there seems to be a real barrier between those two sides of my brain. I am not in the same place when I write as when I do art. I can slip into the art brain easily, at any time, but for writing I have to pull a switch hard to get that side turned on. And once I do it is difficult to turn it off. I try to allow for larger chunks of time when I am writing because I am so preoccupied and I am afraid I will lose the thread if I abandon it before I’ve come to the end. I find that I have more available brain space for writing when I am simply painting on a project and can turn the art brain on autopilot. Also, what’s been curious for me is that I completely focus on writing the best possible story while writing. Only when it is done and polished do I begin to think about how I want to approach the art , then a whole new level of excitement begins! I think this helps also to move the art forward to best reflect the story rather than conforming the story to the kind of art I do. What do I love to draw? Oh my, the possibilities are endless! But it wouldn’t be too sweet or cute. I am trying to coax into the open the part of me that responds to other’s works whether it is writing, art, music, or movies. I think if I can better define what resonates within myself I can incorporate that into my own work better and create something that is more unique, more personal and more satisfying not only for me but for my reader/viewer. And what I respond to is a little creepy, a tiny bit morbid, is multi-layered, ironic, funny, and authentic. If Im really shooting for the moon, my viewer will be able to discover a truth in it about themselves and the world around them. Q: I am always finding myself bored with the medium I work in, and longing for a change on my next book. And then I go back again. You work in watercolor. Has that always been your medium of choice? Do you flirt with other materials at all? I want to cheat on watercolor. I want to have a mad, torrid affair with oil. I want a superficial, tawdry relationship with acrylic. I want some lurid digital action! I am thinking about filing divorce papers on watercolor, but I keep coming back. I have had the blessing of being pretty booked up for the past few years. The downside is that it gives me very little time to play around with different materials and techniques. But things will slow down and then I’ll have the free time to experiment and the joy of fretting over when the next project will come in. 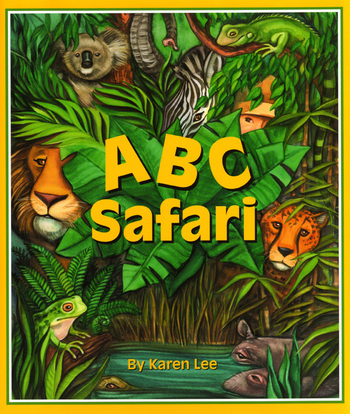 Q: I read that ABC Safari was inspired by seeing the manatees. Any other real life inspirations coming up? Other books soon to be released? I am always inspired by real life! I don’t know where it will go, but I am currently working on the dummy for a rhyming story that was inspired by the discovery of a small family cemetery right smack in the middle of our suburban neighborhood. It’s all fenced in and overgrown and I didn’t notice it until I was walking the dog past there last winter when the trees were bare. I took the kids in there and they were fascinated by who these people were to each other and how old they were when they died. When you stumble onto idea starters like that it is best to just thank whatever powers you believe in that you found it and do something about it, even if it is ten years later. I am also working on the final art for the next book in the math series I am doing with Sylvan Dell, My Half Day by Doris Fisher and Dani Sneed.. This one is about fractions and it is the craziest one yet. 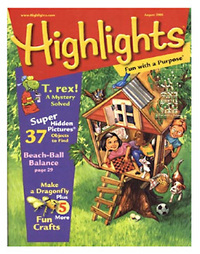 Fun to paint, fun to read. It will be out spring 2008.
" Some people think I am funny, but nobody thinks I am as funny as I do. I crack myself up all the time." I am queen of punny, corny jokes, bad singing, awkward dances, and overdone drama. I like to see my kids squirm with embarrassment. I like dumb, overdone gags. If I am slicing some cheddar and the kids ask me for some I will invariably say “oh, would you like me to cut the cheese for you? I’d love to cut the cheese!” It is so not funny but I laugh and laugh. Just dumb silly stuff. 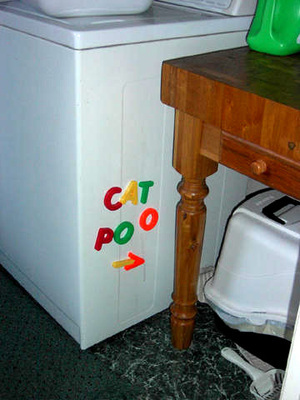 Shortly after we got our cat I put magnet letters on the dryer right next to the litter box saying “cat poo? “. Like the cat can read! Like we don't all already know where it is! Like we need to be reminded constantly! It still makes me laugh, just the ridiculousness of it.